FRIDAY: Pancakes or cereal or Pop-tart, fruit, choice of milk or juice. MONDAY: Muffin, orange slices, choice of milk or juice. TUESDAY: Pop-tart, pineapple tidbits, choice of milk or juice. MONDAY: Breakfast pizza, assorted cereal, fruit, juice, milk. TUESDAY: Dutch waffle, assorted cereal, fruit, juice, milk. 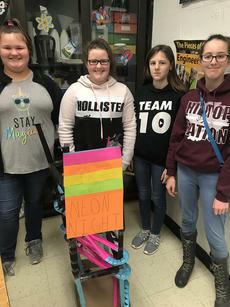 The 7th grade students at Harrison County Middle School were asked to become engineers of a card stock marble roller coaster. 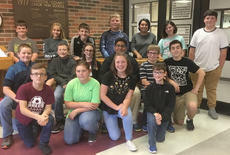 The students were placed into cooperative groups where they planned, created, and executed a marble roller coaster. They had over a week in class to complete this task resulting in roller coasters that towered over six feet tall. Students analyzed the kinetic and potential energy stored in the system of the roller coaster for their final project grade. The Kentucky Council on Postsecondary Education today announced the launch of a new initiative to support military students’ transition to campus. 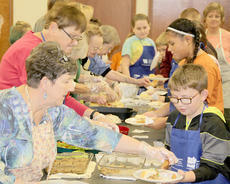 The new centralized resource is the first phase of a long-term plan recently outlined by CPE President Aaron Thompson. The Council on Postsecondary Education (CPE) has been awarded a $400,000 Lumina Foundation grant to encourage more adults to pursue certificate and associate programs in business, information technology, transportation/logistics, advanced manufacturing, healthcare and construction. MONDAY: Breakfast pizza, fruit, choice of milk or juice. TUESDAY: Bacon and toast, fruit, choice of milk or juice. MONDAY: Ham and cheese sliders, assorted cereal, fruit, juice, milk.